South America: Nanay River basin, Loreto, Peru. 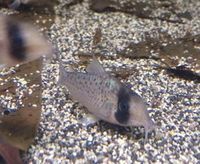 A pretty Corydora that can be mistaken for Corydoras atropersonatus. This Cory differs by being slightly larger, having a longer snout and more, finer, spots on the body. This page was last edited on 13 December 2017, at 03:49.